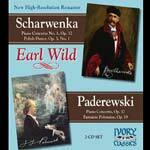 Earl Wild's famous 1970 recording of the Paderewski Concerto Op. 17 with Arthur Fiedler and the LSO is being re-released in a high-resolution remastering by Ivory Classics. Also included is a performance of Paderewski's lively Fantasie Polonaise for piano and orchestra Op. 19 and his Theme and Variations Op. 16, No. 3 for solo piano.